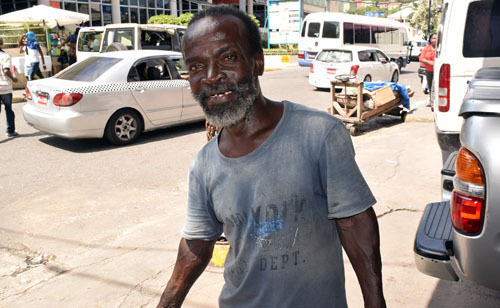 If St. James, and by extension the St. James Municipal Corporation are not careful, Donovan ‘Wrinkle’ Jones – self-proclaimed king of road-patching, may soon find himself a woman and take his talents to another parish. This warning comes from the veteran road fixer, who’s adamant that if the municipal corporation continues to overlook him in their roadworks projects, he will have no choice but to leave St. James for greener, or in his case, more profitable pothole-ridden pastures. The former Albion All Age School graduate, who resides in the Salt Spring area, is well-known across St. James for his often one-man exploits at road-patching, which are often done without any official assistance, and usually, to his credit, are done well. Despite his years of being the parish’s premier handyman, according to Jones, he is not being appreciated enough. 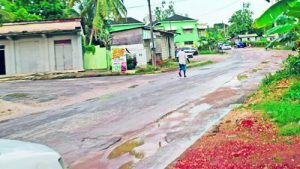 Westmoreland: This is a pothole-ridden road in Little London that needs to be patched, and once he migrates to that area, Wrinkle said he plans to work on it. According to Jones, he would always be given a stipend by appreciative taxi drivers and motorists who use some of the roads he has worked on, which he would collect with his signature basin seen with him at each project he would assign to himself. As of lately though, Jones has witnessed a decline in that generosity. Going against what he describes as his very independent nature, Jones now sees his days spent walking and begging his friends a little ‘pocket change’ just to survive. ‘Wrinkle’ recalled some of his fonder memories of patching roads from his glory days, and shared that on one day in particular, he earned up to eight thousand dollars. This stands in glaring contrast to his current reality, where he barely makes enough, or much at all, to get by. It has indeed been a bumpy road for the ambitious Jones. “I want a job to earn some money as I am getting old,” he stated. With frustration mounting for him, allegations started swirling that as a result, Jones made several attempts to undo some of the patch-work he had done. The allegations further implied that Jones was especially quick to undo these patch works, when he felt that he didn’t collect enough after a hard day’s work. Jones vehemently refuted those claims. “No, no! All a dat a rumours! Mi nuh want di taximan dem kill mi,” Wrinkle joked. He reasserted that he was in fact the king of patching roads, and again appealed to the authorities to include him in their road projects. The Western Mirror contacted Councillor Richard Vernon, in whose division (Montego Bay South) ‘Wrinkle’ falls, who was quick to dismiss claims that ‘Wrinkle’ was deliberately being overlooked by the Corporation. “I think if he goes in and talk to the Superintendent of Roads, Bryce Grant, he would be considered for employment as the Corporation doesn’t take sides in the issuing of works. He should come in to the office, or have someone make a recommendation for him,” Vernon assured. ‘Wrinkle’ continues his wait for employment, with his bags packed and his eyes set on his future wife.